Today, October 20th 2016, the Enable Care home in Chingford, 1 Sewardstone Close was visited by celebrity chef Ainsley Harriott who sampled their delicacies and presented the home with a prize. 1 Sewardstone Close won the top prize in a competition launched by Ainsley earlier this year – aimed at encouraging all the homes in the group to come up with new, creative and innovative dining experiences for residents that can be sustained in the years ahead for residents to enjoy. 1 Sewardstone Close’s entry Tastes from the Around the World Supper Clubs scored highly with judges for providing a new, creative and innovative dining experience. Ainsley presented the residents of the home with a top the range gas barbecue. 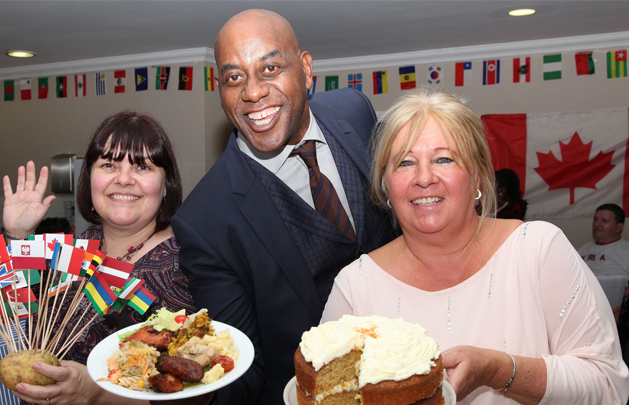 Ainsley sampled their culinary delights from around the world produced by the home’s residents and home’s staff team, whilst having a sing and dance with everyone!